Ask Grace Doleshel why she loves the ocean, and she bubbles with memories of family visits to the rugged Olympic coast: exploring tide pools, walking miles of wild beaches. Shay Steeves also grew up with a love of the sea, swimming and exploring Puget Sound shores. 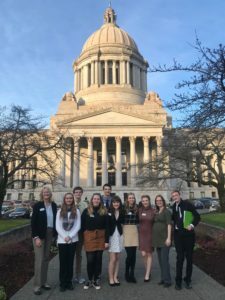 But the high school seniors have another thing in common: both Zoo Guides at Point Defiance Zoo & Aquarium, their shared passion for the ocean and its creatures recently led them to Olympia to testify about why Washington should give up plastic bags. The Olympia visit on Monday, January 21 – Martin Luther King Jr. Day – was part of a joint teen advocacy day with Woodland Park Zoo and the Seattle Aquarium. 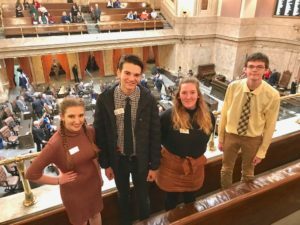 Grace, Shay and six fellow Zoo youth volunteers, along with their Seattle counterparts, met with state legislators to discuss the proposed Washington Reusable Bag Bill. This bill would create a statewide law eliminating the distribution of thin plastic shopping bags, reducing the threat plastic trash poses to marine wildlife and replacing the confusing mix of the existing 27 different city and county bag ordinances. PDZA Conservation Engagement Manager Karen Povey (left) and youth volunteers (L to R): Michelle Owen, Gavin Amer, Bela Dolan, Sam Kerr, Enjoli Shaw, Shay Steeves, Grace Doleshel, Youth Volunteer Coordinator Alex Nicely, Logan Cornwell. After an introductory meeting learning about the legislative process and getting tips from Rep. Joe Fitzgibbon (D-Burien) and Sen. Reuven Carlyle (D-Seattle), the group dispersed to talk with representatives of their home and surrounding districts. After some initial jitters, the students hit their stride. The teens noted that while many legislators support the bill, some had concerns. Those meetings, they agreed, were the most instructive. 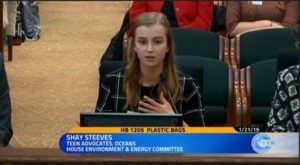 Shay Steevs gives testimony to legislators against plastic bags. Shay Steeves, who has an interest in studying political science, had a chance to bring her passion to center stage by testifying at the bill’s committee hearing. Her poise during an event that would intimidate most adults was impressive. Enjoli and the other teens agreed the Olympia day was a powerful learning experience. “It was really cool to take action by talking to people who make the decisions about the future of our environment,” she said. For Sam Kerr, who plans a career in marine biology, the issue of ocean plastic pollution is personal. Why would eight teenagers give up the freedom of a school holiday to spend the day talking with elected officials – especially when they won’t know the impact of their advocacy for some time? Grace Doleshel summed it up. TAKE ACTION: Find out here about the reusable bag bill and how you can tell your representative how you feel about reducing plastic!